If you want to bring your technical drawing skills to the next level, more specifically skills on rendering perspective, this is the book to get. This book is great for comic book artists and basically any illustrator that has to incorporate perspective in their drawing. The author Marcos Mateu-Mestre is a veteran designer and artist with more than 20 years of experience. He has worked for DreamWorks, does layout, storyboard, visual concept and development. In short, he's a professional of the highest level. Kudos to him for sharing his knowledge in this thick 228-page paperback. This book covers perspective in detail, way more detailed than any other instructional book on perspectives that I've seen. There's a lot of technical talk but always concise and easy to understand. The examples are easy to follow along, and his art is just fantastic. Just like Scott Robertson's books, I would consider this an essential book for comic artists, illustrators and concept artists. 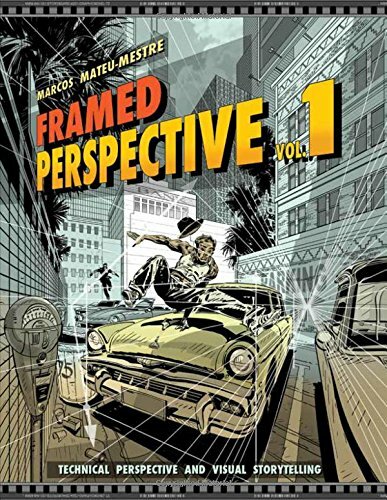 Volume 1 of Frame Perspective covers all the basics of perspective. Volume 2 covers shadows and characters. Both books are good and useful in their own way. Even if they talk about the same subject, they talk about it from their own perspective so you get to see the concept from different mindsets.